Age-related macular degeneration (ARMD) is a degenerative condition of the macula (the central retina). It is one of the most common causes of vision loss in the United Kingdom in those 50 or older, and its prevalence increases with age. ARMD is caused by hardening of the arteries that nourish the retina. This deprives the sensitive retinal tissue of oxygen and nutrients that it needs to function and thrive. As a result, the central vision deteriorates. Macular degeneration varies widely in severity. In the worst cases, it causes a complete loss of central vision, making reading or driving impossible. For others, it may only cause slight distortion. Fortunately, macular degeneration does not cause total blindness since it does not affect the peripheral vision. ARMD is classified as either wet (neovascular) or dry (non-neovascular). About 10% of patients who suffer from macular degeneration have wet ARMD. This type occurs when new vessels form to improve the blood supply to oxygen-deprived retinal tissue. However, the new vessels are very delicate and break easily, causing bleeding and damage to surrounding tissue. Patients with wet macular degeneration develop new blood vessels under the retina. This causes hemorrhage, swelling, and scar tissue but it can be treated with laser in some cases. Dry macular degeneration, although more common, typically results in a less severe, more gradual loss of vision. The dry type is much more common and is characterized by drusen and loss of pigment in the retina. Drusen are small, yellowish deposits that form within the layers of the retina. Macular degeneration may be caused by variety of factors. Genetics, age, nutrition, smoking, and sunlight exposure may all play a role. Eye physicians usually diagnose AMD. Vision testing, Amsler grid test, ophthalmoscopy, fundus photography and fluorescein angiography are some common tests performed during a retinal exam. There is now a reliable test that is intended for patients who have a diagnosis of early or moderate Age-related Macular Degeneration (AMD). The AMD genes inherited from parents are analysed, and by taking into account the history of the patient’s smoking, the Macula Risk Test identifies those who are most likely to end up with AMD, with the resultant loss of vision. 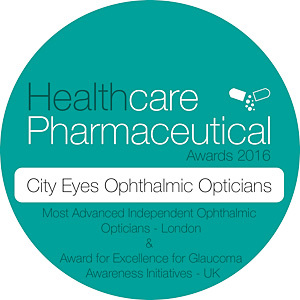 At City Eyes, we carry out a Macula Risk test to diagnose the possibility of loss of vision. The cheek swab sample is taken in our clinic (charges apply). The likelihood of developing Macular degeneration grows from 1 in 10 people who are over the age of 60 to more than 1 in 4 people who are over the age of 75. The majority of people are not aware that they have AMD until there’s a gradual loss of central vision in one eye. The loss of vision can happen very quickly, and without any prior warning. With the advent of the latest treatment protocols, the loss of vision may be prevented, or even improved in some cases.. The earlier AMD is detected and treated, the more likely the chance of preventing blindness. We recommend that those who are most at risk should be monitored frequently. Recently, photodynamic therapy has proven to be effective in stopping abnormal blood vessel growth in some patients with wet ARMD. This new type of laser treatment is far less damaging than laser photocoagulation and is the treatment of choice in many cases. Early diagnosis is critical for successful treatment of wet macular degeneration. Studies have indicated a strong link between nutrition and the development of macular degeneration. It has been scientifically demonstrated that people with diets high in fruits and vegetables (especially leafy green vegetables) have a lower incidence of macular degeneration. More studies are needed to determine if nutritional supplements can prevent progression in patients with existing disease.